Join us on our monthly walks, and feel the power of the Earth. April 21st, Wilder Ranch – on the beach! Before beginning our walk together, we will take a moment to center our minds and bodies. Once we are all fully present, we will begin our journey, walking in silence, all the while tuning in, listening, and absorbing the energies of the elements, plants, and animals. Halfway into our walk we will sit for meditation, a guided visualization, and to share food. 800 Quail Hollow Road, Felton. From Highway 17, take the Scotts Valley/Mount Hermon Rd exit. Continue on Mt. Hermon Road for 3.8 miles. Turn left onto Graham Hill Road and go past the shopping center. Turn left onto East Zayante Rd. Take East Zayante Road about 1.9 miles to Quail Hollow Road. Turn left onto Quail Hollow Road and proceed about 1.1 miles to the entrance of Quail Hollow Ranch, which will be on your right. 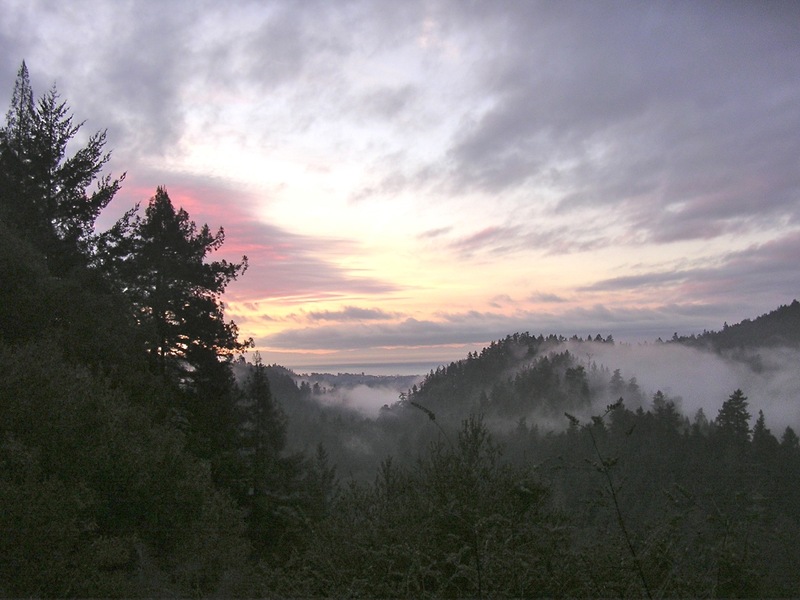 You can also use Graham Hill Road from Santa Cruz, or Highway 9 and Glen Arbor from SLV. Lower entrance. From Highway 17, take Highway 1 North. Bear Right onto Mission Street. Follow Mission Street through town. Parking is on Shaffer Road (just past Western Drive), on the street. Cross Highway 1 (carefully!). Hike begins near the gate and cattle stile across Highway 1. Also available is a “bike corral” for cyclists. Follow Mission to Highway 1 North (A.K.A Coast Road). Left on Shaffer (just North of Western). Park on the street. Cross Highway 1 (carefully!) Meet near the gate/cattle stile. 1401 Coast Road, Santa Cruz. We will meet near the restrooms in the main parking lot. 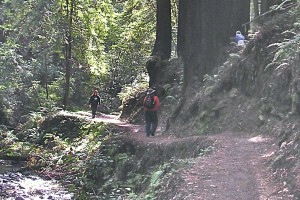 The park is north of Santa Cruz, west of Highway 1, a mile or so past Western Drive. From Highway 17, take Hwy 1 N towards Half Moon Bay for 1 mile. Turn right on Mission St (also still Highway 1). Continue for 3.2 miles. Turn left into the Wilder Ranch driveway. Watch for the sign. Entrance is free, but parking is $8. Free parking is available outside of the park on Highway 1, but you will have to walk into the parking lot a little ways. Parking is free! From Highway 17, take the Scotts Valley/Mount Hermon Rd exit. Continue on Mt. Hermon Road for 3.8 miles. Turn right onto Graham Hill Road. Continuing past Highway 9, the road now becomes Felton-Empire Grade. Go about 1/2 mile and turn right into the parking lot. Caution, it is very easy to miss this turn. Head for the George Washington Grove, which is NOT the main entrance! 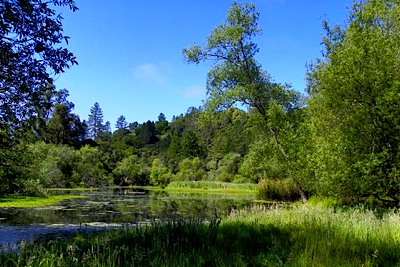 If you are coming UP Branciforte Drive from Santa Cruz, pass by the main entrance to DeLaveaga Park. About 1/4 of a mile further on you will see another entrance to the park. Take it! That is the George Washington Grove and 40 thieves picnic ground, where we present Beltane and the Harvest Festival every year. Meet at the end of the parking lot. We use the rear entrance to the park. From Southbound 17, stay on the road as it becomes Northbound 1. (Don’t get off at Ocean St.) Stay to the right. Continue on around the big left hand curve until the intersection of Mission St.
THEN make an immediate right onto Highland Ave. Pass by a little street and then turn left onto High St.
Stay on High St. for about 1/4 of a mile. Follow Spring St. Upupup for 1/4 mile until it ends. Park as close to the end of Spring St. as possible. The trail head is just north of the Horse Show Grounds, across from the mini-mart at the intersection of Graham Hill Road and Nepenthe.From Highway 17 Southbound:Take the La Madrona / El Rancho exit. Turn left on La Madrona. Proceed about 1/4 mile, to Sims Road. Turn right on Sims Road. Proceed about 1/2 mile, to Graham Hill. Turn right at Graham Hill. On the left is a sign for the “Southern Boundary of the Park”. Once past that take the next left down into a dirt parking lot.Directions From Santa Cruz:From Ocean St. northbound, turn left at Ocean / Plymouth (the last traffic light before Highway 17 starts). Bear right on Graham Hill Road and go for 1 1/2 miles. Look for the park sign as above and park under the trees on the left. This is within the boundaries of Nisene Marks State Park, but off in a corner of the park that most people know nothing about. Here is how to get there: Southbound Soquel Avenue, just past Cabrillo College, in Aptos. Turn Left onto Vienna Drive. Continue on Vienna all the way till it ends (about 1 mile). Turn left onto Wilshire Drive. This will end in half-a-block at Danube Drive. Park anywhere on these two streets. Our meet-up spot is the intersection of Wilshire and Danube. The trailhead is right next door. There is a small creek at the turnaround spot for this walk. You might bring a small towel, if you feel like splashing around. We use the rear entrance to the park. From Highway 17, take Highway 1 North. Bear right onto Mission Street. Follow Mission Street to Swift Street, and turn left on Swift Street. Turn right onto Delaware Avenue. Park on the street near Swanton Boulevard. We meet at the back entrance gate. The park entrance is South of Felton on Highway 9. Official meeting place is outside of the Gift Shop within the park grounds. You can choose to pay the fee to drive through the entrance and park. Or you can choose to park out on Highway 9 and hike in. 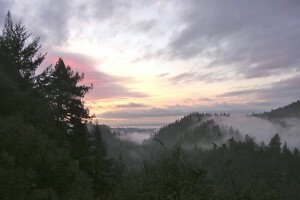 From Santa Cruz – The park is about six miles north of Santa Cruz on Hwy. 9. We hope to see you out in Nature!